German University in Cairo - Cairo University ranks first and The German University in Cairo (GUC) ranks second among the top ten universities in Egypt according to SCIMAGO Institutions Rankings. Cairo University ranks first and The German University in Cairo (GUC) ranks second among the top ten universities in Egypt according to SCIMAGO Institutions Rankings. 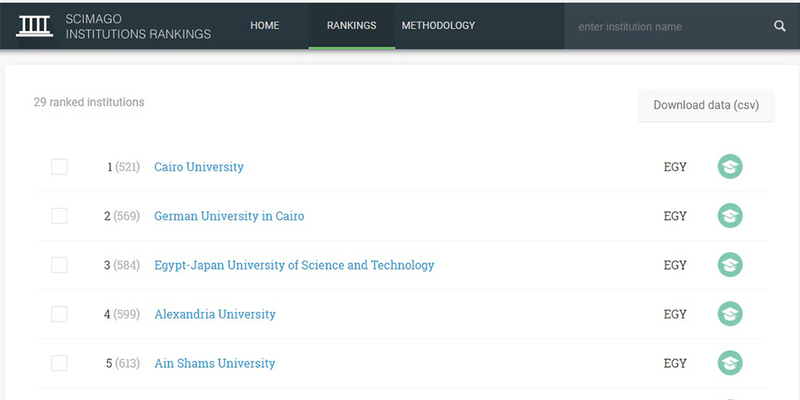 According to SCIMAGO Institutions Rankings, published recently, Cairo University ranks first in Egypt (521st globally) while The German University in Cairo (GUC) ranks second (569th globally), the Egypt-Japan University of Science and Technology (EJUST) ranks third (584th globally). Alexandria University ranks fourth, Ain Shams University ranks 5th and Mansoura University ranks 6th followed by Assiut University and Al Azhar University in the 7th and 8th places, respectively. The American University in Cairo comes ninth in the ranking and Zagazig University ranks tenth. SCIMAGO Institutions Rankings is a research-based evaluation to assess worldwide universities and research-focused institutions. Academic and research-focused institutions are ranked by a composite indicator that combines three different sets of indicators; research performance, innovation outputs and societal impact.